Turkey’s foreign policy approach started to transform from a more liberal and humanitarian foreign policy to a more realistic and pragmatic one in 2016, which was manifested in the Syrian civil war. In this period Turkey started to prioritize the use of hard power in order to prevent the threats resulting from the civil war. This paper asserts that while Turkey’s objectives in the Syrian crisis have remained stable, its priorities have changed especially in recent years. So, while from 2011-2016 humanitarian norms dominated Turkey’s Syria policy, after 2016, these norms became secondary priorities, and were replaced by hard power-based military assertiveness. To support this hypothesis, six main objectives of Turkey’s foreign policy are taken into consideration: Managing the humanitarian crisis, materializing the fall of the Assad regime, aiding the opposition forces, waging a proxy war with Iran, eliminating the threat of Daesh, and preventing the PYD/YPG from creating an area of dominance. Türkiye’nin dış politika yaklaşımı, 2016 yılında liberal bir çerçeveden ayrılarak realist bir anlayışa sahip olmuştur. Bu değişimin en net göstergesi ise Suriye iç savaşıdır. Zira Türkiye, Suriye iç savaşından kaynaklı tehditleri önlemek amacıyla askeri güç kullanımını öncelemiştir. Bu makale, Suriye krizi karşısında Türkiye’nin hedeflerinin sabit kaldığını ancak son yıllarda önceliklerinin değiştiğini iddia etmektedir. Nitekim 2011-2016 yılları arasında insani normlar Türkiye’nin Suriye politikasını belirlerken, 2016 yılı sonrasında bu normlar ikincil öncelikler olmuş ve sert güç odaklı askeri operasyonlarla yer değiştirmiştir. Makale bu varsayımı desteklemek amacıyla Suriye krizine karşı Türk Dış Politikası’nın altı temel amacını merkeze almıştır. Bu amaçlar sırasıyla; Suriye’de ortaya çıkan insani krizi yönetmek, Esed Rejimi’nin yıkılması, muhalefet güçlerine destek, İran ile yapılan vekalet savaşı, DAEŞ tehdidini yok etmek ve PYD/YPG’nin hakimiyet alanı kurmasının engellenmesidir. Abdo, G. (2011, August 25). How Iran Keeps Assad in Power in Syria: The Weapons, Technology, and Expertise Tehran. Retrieved from Foreign Affairs. Al Jazeera. (2012, December 12). ‘Friends of Syria’ Recognize Opposition. Al Jazeera. (2012, August 13). Syrian Opposition Calls for No-fly Zone. Al Jazeera. (2013, May 10). Turkey PM ‘Will Support’ Syria No-fly Zone. Ataman, M. (2016, December 22). The Impact of Iranian Over-expansionism on Regional Politics. Retrieved from Daily Sabah. Barkey, H. J. (2016). Syria's Dark Shadow over US-Turkey Relations. Turkish Policy Quarterly, 14(4), 26-36. Barrett, R. (2017). Beyond the Caliohate: Foreign Fighters and the Threat of Returnees. The Soufan Center. BBC News. (2011). Q&A: Syrian Opposition Alliance. Benmelech, E., & Klor, E. F. (2016). What Explains the Flow of Foreign Fighters to ISIS? National Bureau of Economic Research. Bishku, M. (2012). Turkish-Syrian Relations: A Checkered History. Middle East Policy, 19(3). Convention Relating to the Status of Refugees. (1951, July 28). United Nations Treaty Series, 189, 2545, 154. Geneva. D’Alema, F. (2017). The Evolution of Turkey’s Syria Policy. Istituto Affari Internazionali. Daloğlu, T. (2013). Friends of Syria Deliver Nothing New. Retrieved from Al Monitor. DGMM. (2014, April). Law on Foreigners and International Protection. Retrieved from Republic of Turkey Ministry of Interior. Durukan, O. (2015). Country Report: Turkey. Asylum Information Database. Girit, İ. (2016, October 14). Turkish Support Crucial in Fight against DAESH. Retrieved from Anadolu Agency. HABERTÜRK. (2017, March 29). MGK Toplantısı Sona Erdi! İşte Yapılan Açıklama. Holliday, J. (2013). The Assad Regime: From Counterinsurgency to Civil Was. Washington, DC: Institute for the Study of War. Hudson, J. (2016, June 28). Top U.S. Official: Islamic State Has Lost 47 Percent of its Territory in Iraq. Retrieved from Foreign Policy. Hürriyet. (2011, January 15). Güriş’ten Komşuya Gev Yatırım. Irish, J. (2012, February 4). France, Partners Planning Syria Crisis Group: Sarkozy. Retrieved from Reuters. Islam, T. (2016). Turkey’s AKP Foreign Policy toward Syria: Shifting Policy during the Arab Spring. International Journal on World Peace, 33(1). Karouny, M., & Tattersall, N. (2013, April 20). Syrian Opposition Voices Frustration with International Backers. Retrieved from Reuters. Kasapoglu, C., & Ulgen, S. (2017). Operation Euphrates Shield and the al-Bab Campaign: A Strategic Assessment. Ankara: EDAM. Keyman, E. F. (2017). A New Turkish Foreign Policy: Towards Proactive “Moral Realism”. Insight Turkey, 19(1), 55-69. Kozak, C. (2017). Iran's Assad Regime. Washington D.C.: Critical Threats Project and Institute for the Study of War. Öḡütçü, M. (1994). Islam and the West: Can Turkey bridge the gap? Futures, 26(8), 811-829. Özdemir, Ç. (2017). Suriye 2016. Ortadoğu Yıllığı. Pamuk, H., & Bektaş, Ü. (2016, August 26). Turkey Fires on U.S.–backed Kurdish Militia in Syria Offensive. Retrieved from Reuters. Priya, L. (2017). Astana Talks: A Prelude to Peace in Syria. Institute for Defence Studies and Protocol Relating to the Status of Refugees. (1967, OCtober 4). 606, 8791, 270. New York: United Nations Treaty Series. Republic of Turkey MFA. (2009). Joint Political Declaration on the Establishment of the High Level Strategic Cooperation Council Between Governments of the Republic of Turkey and the Republic of Iraq. Republic of Turkey MFA. (2012). Chairman’s Conclusions Second Conference of The Group of Friends of the Syrian People. Republic of Turkey MFA. (n.d.). Turkey’s Political Relations with Syria. Reuters. (2017, January 20). Turkey Can no Longer Insist on Syria Settlement without Assad - Turkish Deputy PM. Rezaei, F. (2018). Iran’s Nuclear Agreement: The Three Specific Clusters of Concerns. 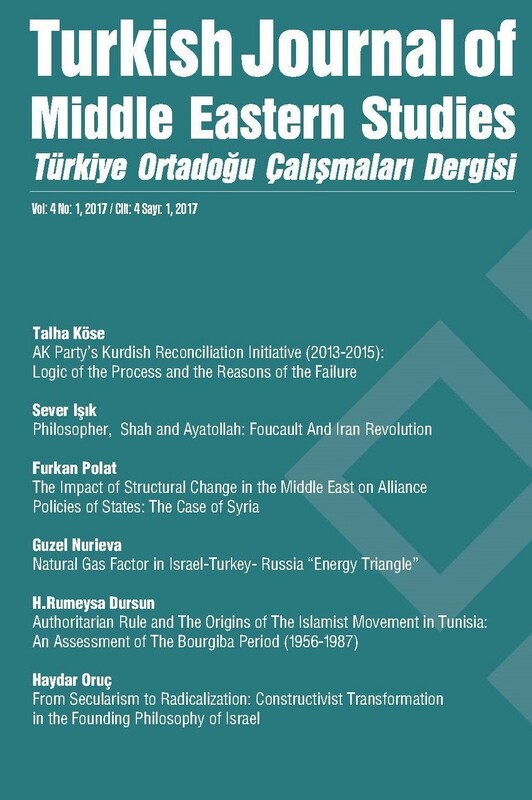 Insight Turkey, 20(2), Forthcoming. Siddiqa, A. (2017). Third Round of Astana Talks: A Gordian Knot in the Making? Institute of Strategic Studies. Solaker, G. (2015, August 11). U.S. Denies Reaching Agreement with Turkey on Syria ‘Safe Zone’. Retrieved from Reuters. Syrian Arab News Agency. (2013, January 6). President al-Assad: Out of Womb of Pain, Hope Should Be Begotten, from Suffering Important Solutions Rise. Retrieved from Syrian Arab News Agency. Taylor, G. (2017, February 7). Trump to Approve Weapons Packages to Saudi Arabia, Bahrain Blocked by Obama. Retrieved from The Washington Times. Tisdall, S. (2015, July 27). Syrian Safe Zone: US Relents to Turkish Demands after Border Crisis Grows. Retrieved from The Guardian. UN. (1951). Convention Relating to the Status of Refugees. United Nations Treaty Series. UN. (1967). Protocol Relating to the Status of Refugees. United Nations Treaty Series.UNHCR. (2012b, May). Pledges 2011: Ministerial Intergovernmental Event on Refugees and Stateless Persons. UNHCR Turkey. (2011, November 23). Information Notice Regarding Syrian Nationals Seeking International Protection. UNSC. (2012). Security Council Fails to Adopt Draft Resolution on Syria as Russian Federation, China Veto Text Supporting Arab League’s Proposed Peace Plan. Yeşiltaş, M., Öncel, R., & Öztürk, B. (2016). Turkey’s Fight against Daesh. İstanbul: SETA. Yeşiltaş, M., Seren, M., & Özçelik, N. (2017). Operation Euphrates Shield: Implementation and Lessons Learned. Ankara: SETA.